OK, SO...I retested both processors with the most stable ATI drivers, and find that the Celeron kinda struggles when HW Accel is left off. The FF and RW get touchy, and movies occasionally stutter, but not too bad usually. MATRIX and GLADIATOR both played FINE on both, with only minor glitching on the Celeron, and this was with NO HW ACCEL. The quality of DVD encoding made a difference. X-MEN played well with HW ACCEL on or off, but PATRIOT and BRAVEHEART were painful. The P3 tests were much more forgiving. Even without HW Accel, it sailed through smoothly on most titles even when using FF/RW or watching TOUGH scenes that glitch most players. This is a screen capture done while paused. 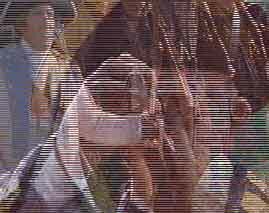 When playing this scene from THE PATRIOT, the moment where you saw this distortion lasted maybe 1/10th of a second, it was a blur! But I saw it at regular speed and decided to slow down for a look. Manually changing the player to BOB mode deinterlacing removed this glitch, but bothered other scenes that want to be drawn in WEAVE mode. WinDVD did not struggle with this. And this was a hard glitch to find (its THAT small). With HW Accel OFF, most other PATRIOT problems vanished, And PowerDVD even passed the T2-ULTIMATE ending scene that WinDVD never has smoothly played for me! PowerDVD with ATI HW Accel off is mostly glitch free, sharp images, nice colors, and the FF/RW speeds worked exceptionally well! Older PowerDVD players CRAWLED when using FF/RW, but NO MORE! The updated engine now sails through use of FF and RW as easily as Cinemaster or WinDVD. Good step up! The sharper images are a step up. Keep in mind though, sharper equals more eye-focusing and strains your eyes more than a slightly softened/blurred image does. The improved engine with now exceptional FF/RW operation is HUGE! Overall image quality is better. WinDVD still wins the Video prize for users with a powerful enough machine to USE WinDVD, and Cinemaster still beats PowerDVD on ATI or ELSA video cards (Especially NOW while Cyberlink awaits ATI finishing the new codes). But overall, with Non-ATI cards, or when HW accel is off on slightly faster ATI equipped machines, it's a very pleasant playback experience. When you couple the updated engine and sharper image with the great interface that allows you to do it all so easily, the video playback is VERY GOOD. The battle rages on!